Junibacken is one of the most popular tourist destinations in Stockholm. The exhibition/interactive playground is centered around Swedish author Astrid Lindgren’s beloved children’s books, such as “Pippi Longstocking” and “The Brothers Lionheart”. 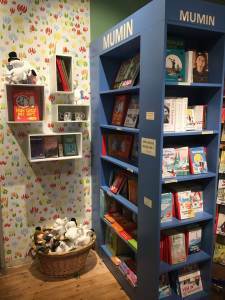 In 2015 another popular Nordic children’s book series got their own exhibition at Junibacken: The Moomins, written by the Finnish author and artist Tove Jansson. The Moomin exhibition has been such a success that Junibacken decided to extend it for another year. 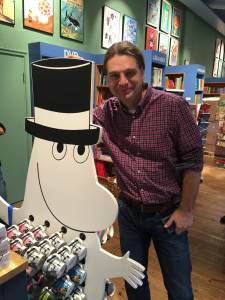 We spoke to Björn Edlund, CEO of Junibacken, about what makes the Moomins such crowd-pleasing favorites and merchandising mega-stars. Tell us about how the idea for a Moomin Exhibition at Junibacken arose? Moomin is truly one of our dream brands, and there are not a lot of in them in children’s books industry. We were looking for a new show and it coincided with Moomin 70th anniversary, so it was a natural combination. It felt like a great fit to us from the very first day! How has the interest for the exhibition been, compared to the expectations? It has actually exceeded expectations. It is great for Junibacken as a brand to work with Moomin. Firstly, it is a global brand. Secondly, the Moomin characters have much stronger support among Swedes than I thought, and the children are also fonder of the Moomin characters than we expected. So it has really exceeded expectations in every way. Why do you think Moomin is so popular even after 70 years? Tove Jansson’s books appeal to all audiences. They are truly timeless and they are not gender-segregated. The stories include something for all ages. It does not matter if it is 1955 or 2015, both the characters and the world is always relevant. At Junibacken it’s not just families who visit the exhibition but also adults who come both to see the exhibition and especially buy merchandise in the shop. Do you receive many foreign visitors because of Moomin? We have many visitors from Finland, of course, but then there are also many visitors from Russia who know the Moomins very well. Visitors from the UK are also familiar with Moomin. These are the three countries that we get the most visitors from anyways, so the Moomin exhibition was really a perfect addition to us. How is your own relationship with the Moomins, are you a fan? I myself am from a teacher’s family, so I actually grew up with Moomin and many in my family preferred Moomin to Astrid Lindgren’s characters. But for me Moomin is without a doubt just as relevant for adults as for children. I have, for example, read the comic strips all my life and still read them. It’s funny, because that’s one thing that really changed over the years. When I was younger it mainly Moomintroll that I related to, but now when I am an adult and a parent both Moominmamma and Moominpappa are suddenly more sympathetic. Moominpappa is probably my favorite character today. What about the sale of the products in the shop? Of all the products with different characters we sell in our shop the Moomin products are by far the most popular. 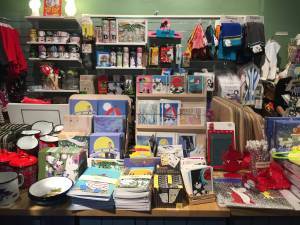 We are constantly replenishing them because they sell out, and we are currently discussing bringing in several more Moomin products next year. Both the various design objects, the toys and books are immensely popular. What kind of products sell best? Something that has sold extremely well are the kids’ clothes. We have sold a lot more of them than what we thought. The thing you notice with them, and with all the other Moomin products we sell, is how high the quality is, and how much it is appreciated by the customers. The Moomin mugs from Arabia also sell incredibly well, but it was not as unexpected as the children’s clothes. If you could give one of your products to anyone in the whole world, what and to whom? I would give a Moominmamma Mug to Hillary Clinton and wish her good luck in the upcoming elections! Find out more about Junibacken, the exhibition, the book shop and opening hours on their website: www.junibacken.se.